My name is Ted Tenold, and since 1996 I have been working as a polisher of traditional Japanese swords, both antique and contemporary, and works of modern Western smiths who make swords inspired by the Japanese tradition. Japanese sword restoration is, however, my primary focus. My pursuit of this craft began with a humble awareness of my own ignorance and I polished only Japanese-inspired works by American smiths, such as Bob Engnath and Howard Clark. My interest has always been in traditional Japanese swords, but I knew it was best to avoid polishing antique swords without proper training in traditional polishing. 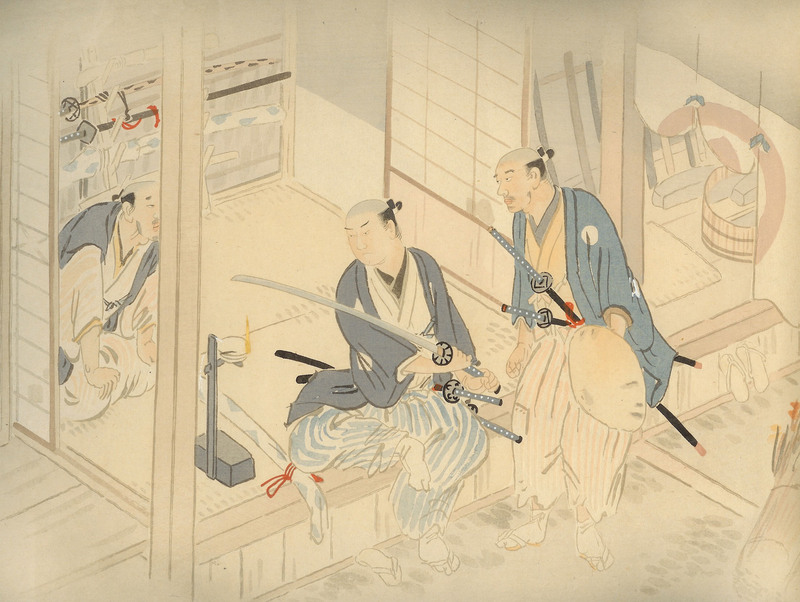 Two samurai examining a sword at a polisher's shop in the Edo period. Modern swords had few of the considerations that antiques carry with regard to conservation issues. As a martial artist, I also found that there were few reasonable options for those involved in Japanese sword arts to utilize in their practice without either implementing something cheap and dangerously unpredictable, or an antique that could be damaged if used in the rigors of their practice. Therefore, providing these folks with proper swords to carry on their arts without potential loss of art swords was a warm compromise with my desire to polish. In the meantime, I pursued an avenue to learn the traditional craft of polishing art swords I was so passionate about. I had meet Michael Christianson and been to his sword shop a few times before I actually took an interest in polishing. I knew he was active as a restoration polisher in the antique sword community. Later, he explained he had trained with Bob Benson, one of the Nihonto community’s most respected polishers and scholars. 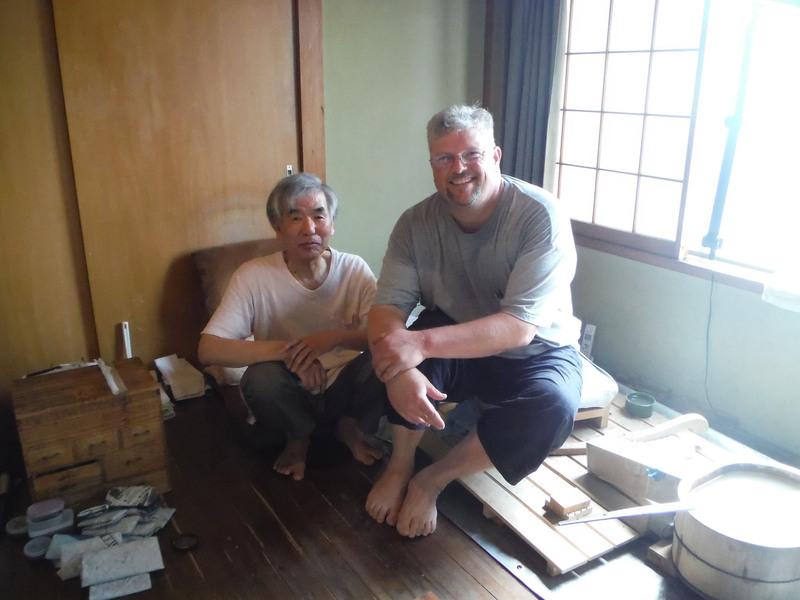 Bob studied polishing in Japan in the 1960’s with some of the most notable polishers in Japan including the Living National Treasure sword polisher, Ono Kokei. He was the first non-Japanese to be recognized specifically for his polishing work with an award from the Japanese government. I had asked Mike to take me in and train me on several occasions, which to my disappointment he continually declined for a variety of reasons. Eventually, he saw a polish I had completed on a contemporary sword and agreed to instruct me in polishing traditional works. I spent every free moment I could in his shop driving nearly 100 miles (98 to be exact) each way to be there. After a couple of years, I ended up moving closer to him, and we spent even more time together. Since the first day I arrived at his shop in Loma Linda, California to learn polishing, my life has quite literally been consumed by Japanese swords. There is only very rarely a day that goes by that I do not study, work on, or research Nihonto, and I can only say that my enthusiasm and drive grows stronger with every passing day. Mike recognized my passion and drive, and my skills became more refined with each sword I polished. Seven years later, while examining a polish I had completed for him, he proudly looked at me and said my work had exceeded his best expectations, and that it was apparent that I had surpassed his own abilities. Thus ended my tenure as an apprentice, but never would change my belief that I will always be a student of the sword. So I sought other teachers, and more ways to grow and improve my craft, and continue to supplement my studies by traveling throughout the U.S. and Japan to museums and Japanese sword related events. It is not my position or desire to become a teacher of polishing, yet I do wish to introduce anyone interested to the fantastic and beautiful art form of the Japanese sword. It is not something that can be learned through electronic means or verbal communication. One must have mentors and teachers that can convey the finer points in the presence of great pieces. But teachers do not come to students. Students must go to teachers. It is not cheap, nor is it convenient. Worthwhile education never is, and there are no shortcuts. If you have need of services, please call for a quote. If you have questions, I will gladly answer to the best of my ability at my earliest convenience. I do often translate or comment on pieces for folks without charge, but may require some reimbursement if research becomes time consuming. I do charge for formal appraisals and/or written evaluations for estate management purposes. Please inquire if you are interested in this service. I place items for sale on this site quite often. It not only helps my clients with transitioning and improving their collections, but also supplements my polishing income and augments my ability to continue studying abroad.